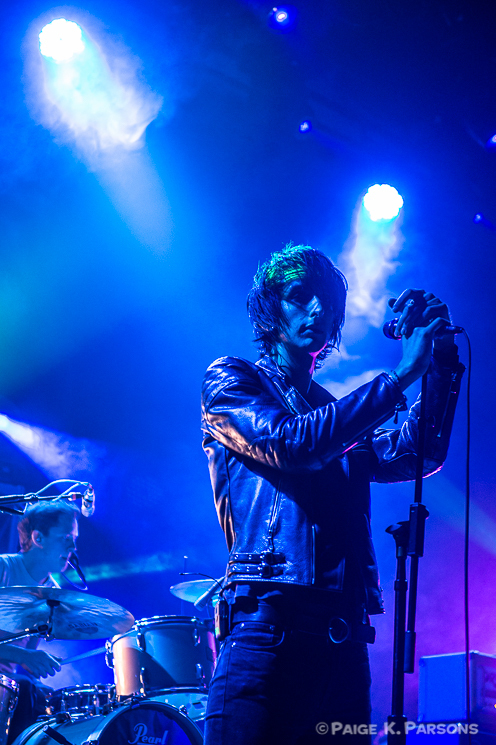 The Horrors have been playing music together for nine years. 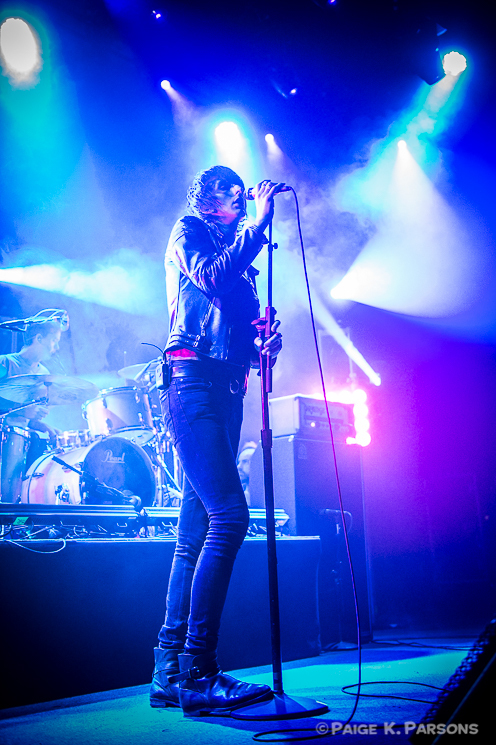 The band formed in England in 2005, and over the course of their four albums have gone from the punk-infused Strange House (2007) to the textured, layered sounds of Luminous (2014). 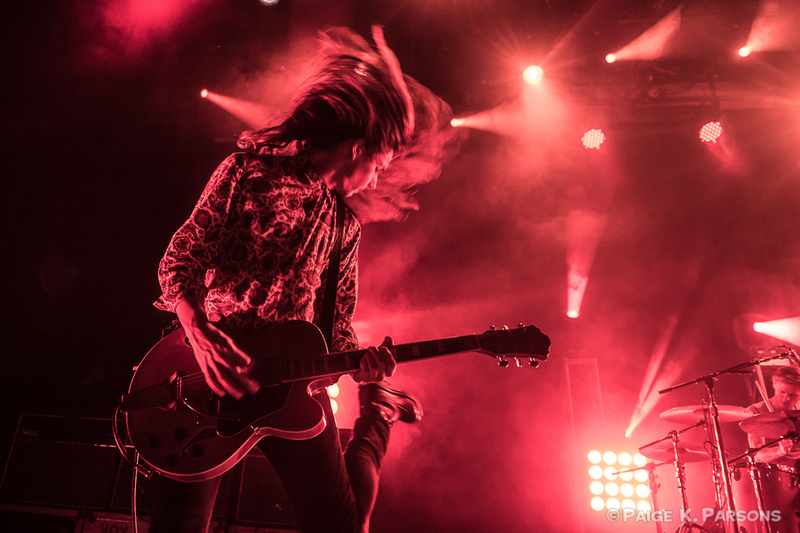 It's always interesting to see how different bands bring life to those layered, dream pop, and shoegaze-y songs on stage. Psychedelic synths and echo-y guitars have all the makings of falling flat and not connecting with the audience. 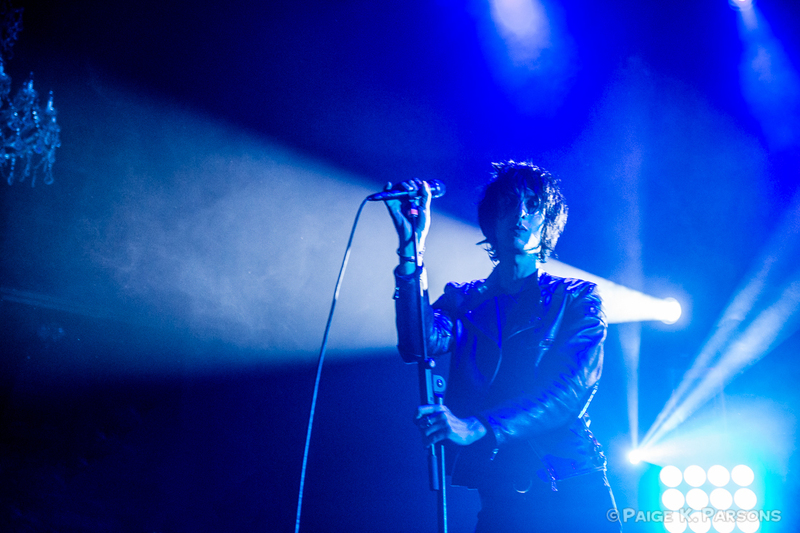 At last night's show at The Fillmore, The Horrors had it down to a dazzling spectacle of prismatic lights - all of the lights. But before the rainbow light explosion of The Horrors took the stage, Moon Duo played a fantastic, thumping psychedelic set. Moon Duo, comprised of Erik "Ripley" Johnson of Wooden Shijps, Sanae Yamada, and newly-added drummer John Jeffrey, created a dark and pulsing mood with intricate shadow-like screen projections that wrapped the entire stage in a what looked like a black, bubbling, paisley flag. The band have just released Live in Ravenna on Sacred Bones Records in September, and are just as captivating on that record as they were on stage last night. Moon Duo's drone-like rock felt especially ramped up with Jeffrey's driving drums carrying a lot of the songs. 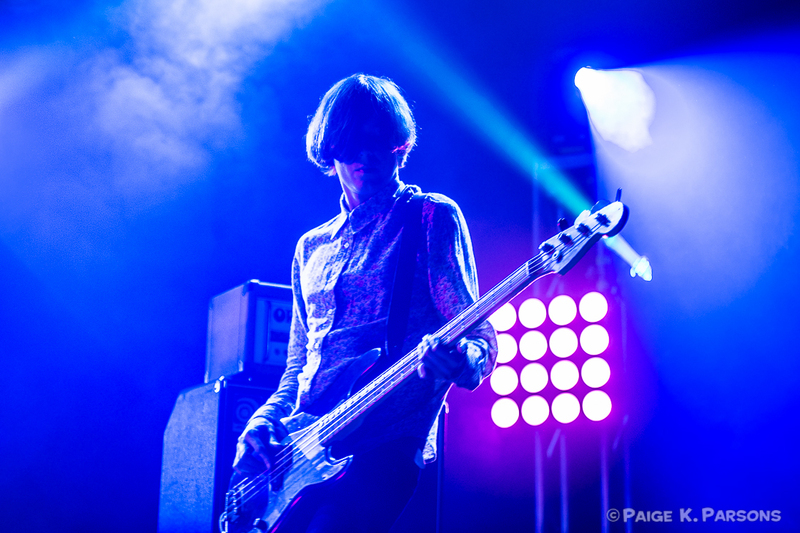 After Moon Duo cleared the stage, The Horrors took their respective spots: elaborate keyboard set-up, drum set-platform, and three Vox amps for the band's guitarist, Joshua Hayward. 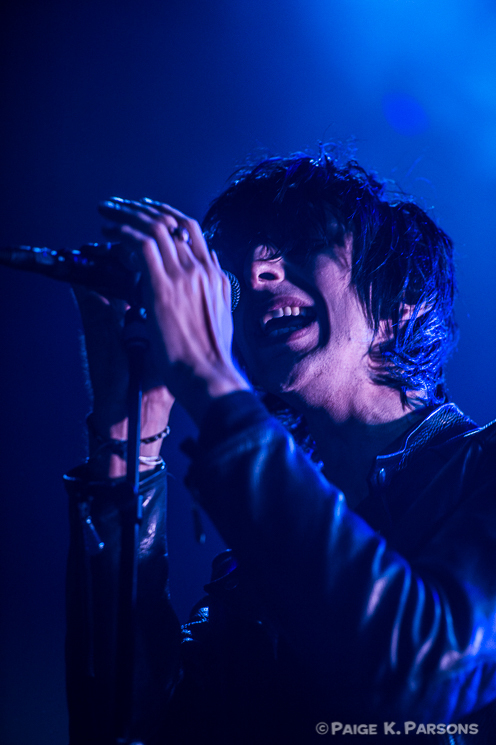 The band opened with "Chasing Shadows," the opening track off Luminous that warms up with a nearly-three minute intro into a soaring synth of a dance track. Judging by the three-amp set up, it was strange how little guitar came through during most of the set. 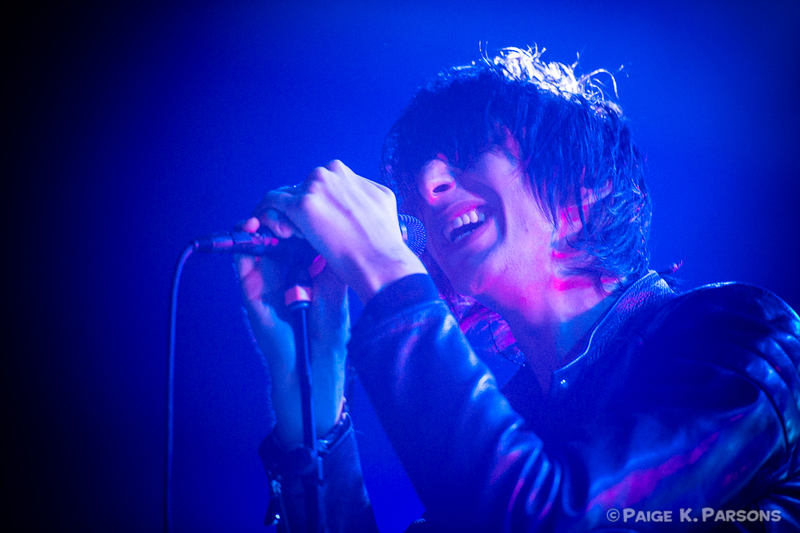 Lead singer Faris Badwan's vocals also seemed lost in the haze, under the dominating layer of keyboard. It seemed to be the sound the band is going for. 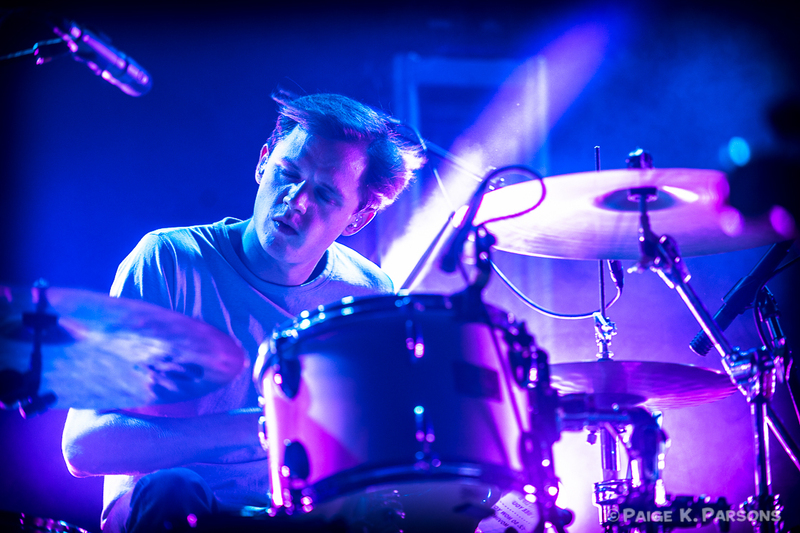 They had faith that the keyboard (much like Moon Duo's drums) will carry their songs--and they did, with keyboardist Tom Cowan holding down the fort. The band primarily stuck with songs from Luminous and their previous album, Skying (2011) and played under a dazzling, beautiful light show...illuminating, if you will. Badwan played the part of mysterious, slightly intimidating frontman very well: tall, thin, unkempt hair, and leather jacket glued on for the whole set. 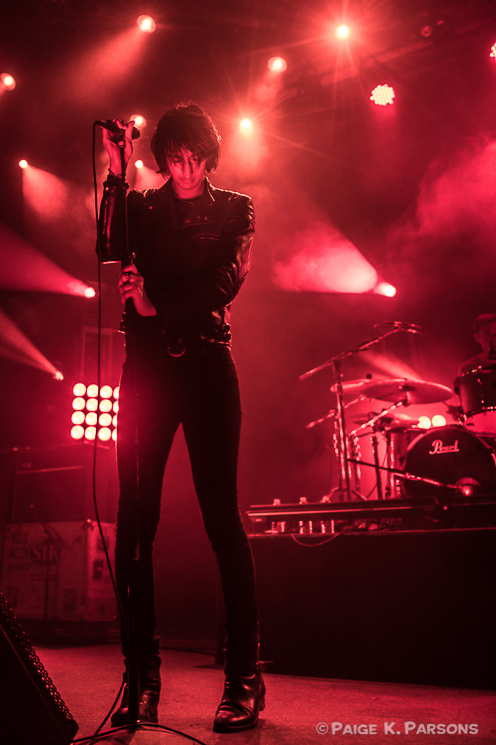 The Horrors closed out the set with a passionate rendition of "I See You" and returned with an encore of their current single, "So Now You Know," before outdoing themselves with a sprawling jammed-out version of "Moving Further Away," and turning in for the night. What was unfortunate about the show was how poorly-attended it was. Insert commentary about ticket prices at The Fillmore here, but last night's poor attendance in particular could also be chalked up to that little game that happened or something. 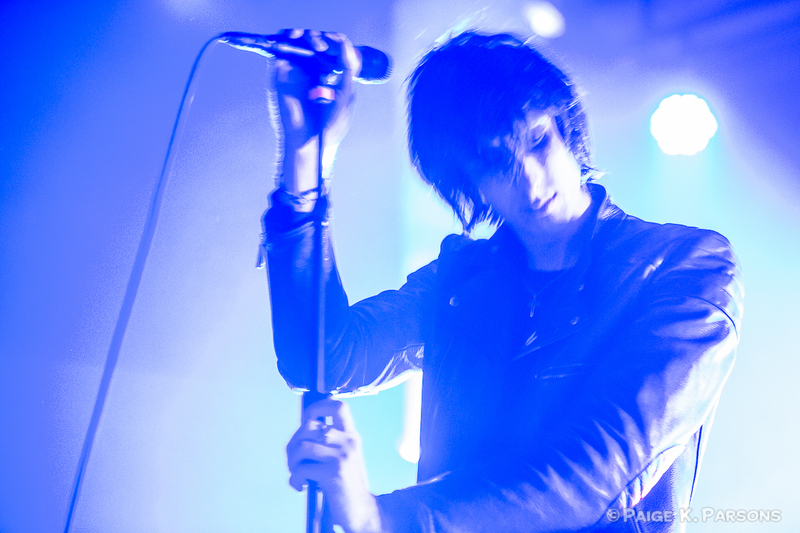 The Horrors, abreast of these developments, chimed in with Badwan telling the crowd something along the lines of "Congratulations about baseball." Thanks, dude. I was really, really excited to see this show. I’ve been a fan of both bands since their inception and thought the pairing would be a real SF crowd draw and provide a Psych/Punk Rock wall of sound to get lost in. For me the night was a complete loss. Moon Duo’s new drummer who you tout as ‘carrying’ the band was a one trick pony who played almost the exact same drum line and beat in three different songs. His over use of maracas prompted me to stifle the urge to yell, “More cowbell” several times. I found their choice of mood lighting completely off putting and didn’t help build any report between the band and it’s audience. 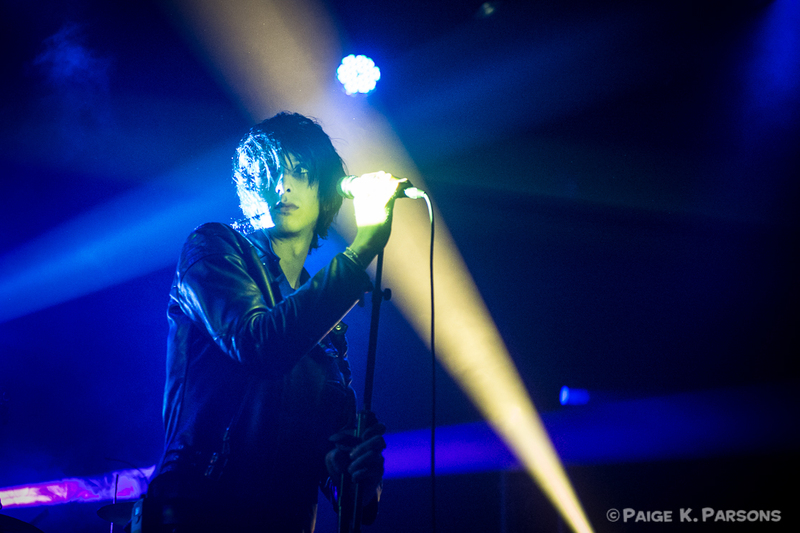 The Horrors doggedly dull set was even less inspiring. Relying on their massive overuse of seizure triggering light show the band – once formable and ominous in their musical presentation- now seemed to be trying to pull off some sort of Brian Jonestown Massacre look circa 1998 topped with a bad 69’s bob cut with the a lead singer who seemed to be battling a mean case of jet lag. Everything about their set was tepid from their choice of material to their interaction with their audience. The Fillmore’s sound overall was completely dismal. Everything was convoluted and muddy. Fuzz/Psych need not be mixed through a blender to have an authentic throwback vibe. 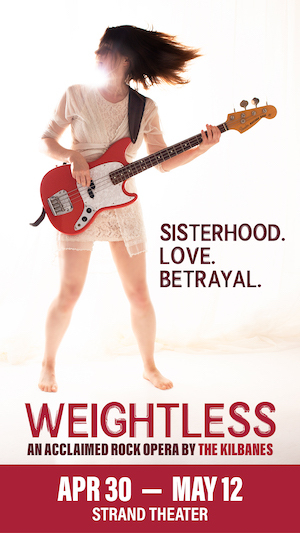 As for price point on tix – I gotta say not so bad unless you factor in the handling fees – and then way to high. Gonna pass next time either one of these bands make their way through town. And the people that attended weren’t that great, it was a mix of older people who fist pumped(?) to most of their set. 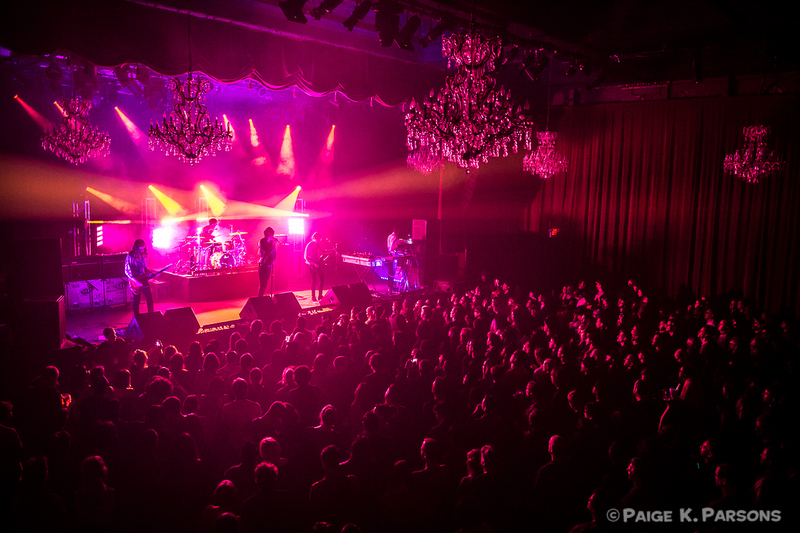 I’d say the Fillmore was about at half capacity. I didn’t really enjoy his vocals as much because it sounded like it was going through a filter that made it sound too high pitched when it sounds best with more reverb. The poor attendance couldn’t be about the ticket prices, they were only $22-25! I don’t know, it was great finally seeing them live after so many years of listening to Primary Colours.